Drug resistance is the main cause of the failure of chemotherapy of malignant tumors, resistance being either preexisting (intrinsic resistance) or induced by the drugs (acquired resistance). At present, resistance is usually diagnosed during treatment after a long period of drug administration. In the present paper, methods for a rapid assessment of drug resistance are described. 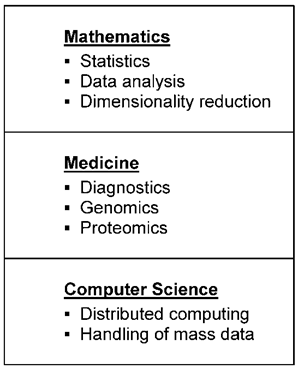 Three main classes of test procedures can be found in the literature, i.e. fresh tumor cell culture tests, cancer biomarker tests and positron emission tomography (PET) tests. The methods are based on the evaluation of molecular processes, i.e. metabolic activities of cancer cells. Drug resistance can be diagnosed before treatment in-vitro with fresh tumor cell culture tests, and after a short time of treatment in-vivo with PET tests. Cancer biomarker tests, for which great potential has been predicted, are largely still in the development stage. Individual resistance surveillance with tests delivering rapid results signifies progress in cancer therapy management, by providing the possibility to avoid drug therapies that are ineffective and only harmful. Since the beginning of cancer chemotherapy the frequent lack of drug response in solid tumors has been a major problem. The main cause of failure to respond to cytostatics is drug resistance. In nearly 50% of all cancer cases, resistance to chemotherapy already exists before drug treatment starts (intrinsic resistance), and in a large proportion of the remaining half resistance develops during treatment (acquired resistance) . All efforts to overcome resistance to chemotherapy so far have failed, owing to the enormous heterogeneity and complex biology of cancer cells, with wide individual variations . Meanwhile, the knowledge of various resistance mechanisms has increased over the years , leading to the development of new drugs that can be specifically targeted. However, the new "targeted" drugs also suffer from a considerable failure rate and from toxicity . The increasing number of new anticancer drugs has not efficiently reduced the occurrence of drug resistance up to now. Diagnosis of drug resistance in individual patients would improve cancer treatment by the avoidance of inefficient treatment. The aim of the present paper is to discuss the possibilities for realizing this goal. The following three methods are available to assess cancer drug resistance: fresh tumor cell culture assays, cancer biomarker tests, and positron emission tomography tests. As early as the 1950s, research teams started to develop laboratory tests in order to predict tumor reaction to cytostatic drugs . They used fresh cancer tissue and examined the effect of the drugs on tumor cell growth. At the beginning laboratory techniques were still in their infancy. Short term cell cultures of cancer tissues were difficult to perform and procedures varied from laboratory to laboratory. However, the cancer cell assays were, thanks to better techniques, continuously improved over the last few decades and brought to a certain perfection. There are two steps in the preparation of the tests, first the fresh cell culturing and then, when this is successful the examination of the drug effect. Cell cultures in medicine are now established laboratory tools. Whereas immortalized cancer cell lines used for research purposes have lost a large part of individual tumor characteristics the preparation of fresh tumor tissue is necessary in order to obtain cancer cells with still highly preserved individual tumor properties . Special arrangements have to be made before the biopsy is taken by the oncologist to garantee a rapid and safe transport of the probe i.e. a specialized laboratory must be contacted, the means of transport and transport medium arranged and precaution taken that the probe is immediately placed in the transportmedium. Extensive descriptions of special laboratory techniques for fresh cancer cell cultures are now available [7, 8]. The cell preparation may vary depending on the tumor type in test. Table 1 shows frequently tested tumor types for which special cell preparations were published [9-27]. For the examination of the drug effect after incubation several methods are in use. In the 1970s the method of measuring the thymidine incorporation into cancer cell DNA  was developed by one of us (M.V.). It estimates the inhibitory effect on cell growth. This technique as well as some others have found their way into laboratory practice. Fig. 1 is a schematic illustration of the procedure of fresh tumor cell culture assays. Although various assays have been developed, the principal steps, i.e. isolation of cells, incubation of cells with drugs and assessment of cell survival are the same. Usually a range of drug doses is applied in order to find a dose-response relationship. Drug concentrations in the tests are similar to drug concentrations usually found in-vivo during treatment. All methods measure molecular processes of cancer cells, revealing cell activity and thus indicating cell growth or death [29, 30]. Frequently used methods are the thymidine incorporation into cell DNA  and the loss of cell ATP . Drug resistance can be recognized by no decrease of thymidine uptake into cell DNA or no decrease of cell ATP. Fresh tumor cell culture assays are applicable to many types of cancer, since they register the integral cell reaction. The predictive value of the assays, depending on cancer tissue, which is usually only available before treatment, consists in indicating intrinsic resistance. Tumor types for which short term primary cell cultures are used to test tumor response to cancer drug therapy. 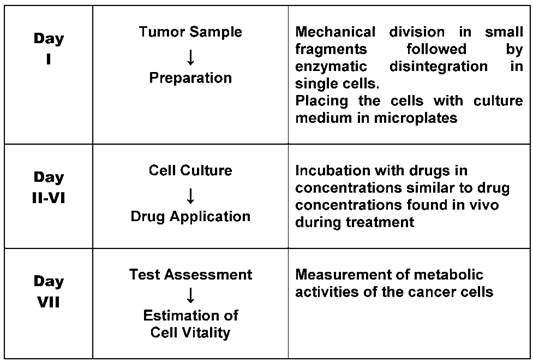 Schematic procedure of fresh tumor cell culture assays. None of the tests developed has been adopted so far in clinical routine practice, mainly because of the lack of general recognition. Critical comments published in the renowned New England Journal of Medicine in the 1980s  on test artefacts causing false results dramatically reduced interest in further research. The verdict which arose then that assays for drug response are unreliable is still widely accepted. This opinion ignores the fact that assay techniques have improved and that test results of drug resistance and drug sensitivity should not be confused: drug resistance is considered as highly predictable, which is not the case with drug sensitivity. Results of sensitive drugs obtained by the net effect of drug action on cancer cells are not very reliably, since many steps in the body are required to reach the target. However, their effectivity may be increased by the fact that cases of ineffective drugs can be eliminated . With the recent recognition, that cancer therapy can be optimized by personalized i.e. individualized drug treatment, interest has again arisen in fresh tumor cell culture assays. Recently ASCO felt induced to publish an assessment of the assays reviewing the literature . It came to the conclusion that the tests are still investigational but asserted that an in-vitro approach has great potential to spare patients the morbidity of ineffective chemotherapy regimens. The ASCO judgment was criticized for the fact that only 12 studies were taken for the evaluation and that no distinction was made between sensitivity and resistance results. Many studies, showing good correlation between in-vitro resistance with in-vivo outcome remained unnoticed . In the 1980s a review, covering 27 studies already showed excellent correlations in different chemotherapy-treated tumor types (>90%) . Similar correlations were found in other comprehensive reviews [34, 38]. In the meantime many more studies on different tumor types have been published, some with variable results. It has been pointed out that the labor-intensive assays should only be carried out by experienced, highly specialized laboratories. Standardization of the tests would make it easier to compare the results of different studies. Ovarian cancer is now one of the best investigated cancer types with promising results for individualized assay-assisted chemotherapies. In a recent review earlier results have been corroborated, i.e. most tumor response tests showed excellent correlation with clinical resistance but varied in their ability to predict sensitivity . Another recent study demonstrated that assay-assisted chemotherapy in ovarian cancer may result in reduced costs compared to empiric therapy . A novelty may be added here: the National Comprehensive Cancer Network (NCCN) in the USA , which provides “Clinical Practice Guidelines for Oncology” mentioned chemotherapy-resistance assays for the first time in a recent update on ovarian cancer treatment (2010). It declared that such tests are being used in some NCCN centers to aid in selecting chemotherapy in situations where there are multiple equivalent chemotherapy options available. In another recent publication , discussing the question of chemosensitivity testing for advanced gastric cancer, it was cited that pre-treatment testing is already approved by the Japanese Ministry of Health in 11 institutes. This shows that interest in further research on fresh tumor cell culture assays has now considerably increased. In-vitro diagnosis of drug resistance has not only been carried out on solid tumors; it has been demonstrated that patients with haematological neoplastic diseases can also profit . Recent publications certify the usefulness of such assays in the rapid recognition of resistance which allows treatment modification shortly after [44, 45]. Tumor markers - also called cancer biomarkers - already attracted attention as diagnostic tools for cancer detection and growth indicators early in the last century . The search concentrated on specific cancer-derived molecules occurring in the blood. Several markers, such as the carcinoembryonic antigen (CEA) and alpha-fetoprotein (AFP), found their way at an early stage into clinical laboratories. Many others have followed in the meantime. However, most of them are not tumor specific. The use of changes of serum markers as a measure of tumor response to therapy seems appealing because it is non-invasive and can be frequently repeated. No special efforts have been made so far to carry out studies to investigate their practical value for this purpose. Only a few tumor markers were used in clinical trials e.g. prostate-specific antigen (PSA) in prostate cancer, CA 125 in ovarian cancer, thyroglobulin in thyroid cancer and human chorionic gonadotropin (HCG) in chorionepithelioma. In these cases it has been shown that the markers fell to very low levels after successful treatment. However, it is still not known to what extent markers can reliably reflect the viable tumor mass. The pathobiology of tumor markers is still not well understood. It remains hard to understand why tumor markers have not been investigated to a greater degree in the huge number of previous chemotherapy studies. Only recently have cancer biomarkers gained wider recognition. The American National Cancer Institute launched the project “Early Detection Research Network” (EDRN) as a new field of cancer research, focused on identifying markers both for the early detection of cancer and of cancer risk. The main aim is creating validated biomarkers for early therapeutic intervention in malignant diseases [47, 48]. A large number of organizations are now participating in cancer biomarker research . Unfortunately the program does not engage in investigation of markers for drug response testing. The pharmaceutical industry now uses overexpressed growth factors, i.e. their cell receptors as cancer biomarkers to develop new targeted anticancer drugs with better tumor response. However, tumor concentrations of growth factor receptors do not reliably predict their therapeutic effect in individual cases. Only in some small subgroups of patients detected by special biomarkers could a major therapeutic success be demonstrated. Examples are: for trastuzumab breast cancer with overexpressed HER2, for imatinib gastrointestinal stroma cell tumor (GIST) with overexpressed C-kit and chronic myeloid leukaemia (CML) with BCR-ABL fusion protein, and for gefitinib and erlotinib non small cell lung cancer (NSCLC) with mutations in the EGFR gene . Another subgroup which benefits from EGFR inhibitor treatment is colorectal cancer with Kras wild type . The search for biomarkers to find new subgroups of cancer patients for treatment with targeted drugs goes on. Potential biomarkers for the prediction of drug response are several proteins which play a role in drug resistance mechanisms. Such cellular factors are resistance proteins, which can be determined by immunohistochemistry. Laboratory experiments with short-term cell cultures of lung cancers have shown that excellent correlations exist between drug-resistant cells and several of the resistance proteins . The determination of resistance proteins in cancer cell biopsies seems a feasible way to detect intrinsic drug resistance. So far no test based on resistance protein determination has been adopted in clinical practice. In a wider sense, pharmacogenetics is part of cancer biomarker research. Tests examine the influence of genetic factors on drug action. New laboratory techniques, for instance genomics, proteomics, and transcriptomics (omics), make it possible to determine a great number of biological molecules whose composition is considered to provide information about the effectiveness and toxicity of drugs. Since investigations using omics are dependent on cancer tissue, which is often only available before the commencement of therapy, only intrinsic resistance can be verified. In order to detect predictive biomarkers highly sophisticated data analytical methods have now been developed. In Fig. 2 a schematic illustration of the main steps for such data analysis, algorithms for fingerprint detection of cancer biomarkers, is shown. Mathematics and Computer Sciences play an important part in observing essential markers comparing biological material from patients with drug resistance with material from patients without drug resistance. Algorithms have to deal not only with the giant mass of data, but also with their dynamic change. Thus it is well known that an individual proteome changes quite dramatically during a day, depending on a variety of factors. Only a large enough group of patients allows to identify components that do not differ much between individuals from the same group. There are already several publications which describe new biomarkers, detected by sensitive analysis algorithms. However, the clinical significance of these substances, such as Let-7i, a biomarker for therapy of epithelial ovarian cancer  or beta III tubulin, a biomarker for chemoresistance in non-small cell lung cancer  has still to be proven. A recent review of biomarkers of chemotherapy resistance in breast cancer discusses the difficulties of clinical biomarker validation . Prediction of cancer drug action with pharmacogenetic assays is still in its infancy. Results still have to be judged critically, since misinterpretations are possible . The microarrays used for the tests are not standardized, which makes it difficult to compare the results of different studies . Diagnosis of drug resistance during drug treatment was difficult in the past. The only method available was tumor size control. A solution was found recently by using a nuclear medicine technique, positron emission tomography (PET). Already in clinical use for many years for the detection of cancer localisation, the method can now also be applied to determine the metabolic activity of neoplastic tissue. Fig. 3 shows the schematic illustration of quantitative cancer image analysis in positron-emission tomography. Schematic illustration of quantitative cancer image analysis in positron-emission tomography. The tomograph captures dynamic uptake profiles following the radiopharmaceutical injection. The blood clearance curve, which serves as the input function for kinetic modeling is obtained from blood pool structures in the image. Blood and tissue curves with a model of radiopharmaceutical kinetics are used to estimate parameters relevant to a particular tumor and its treatment. In clinical practice a more simplified and practical alternative to kinetic analysis is often used. It is termed standard uptake value (SUV) and defined as the radiopharmaceutical tissue uptake (kBq/ml) divided by the injected dose per unit patient weight (MBq/k). SUV has a value of 1 for uniformly distributed tracer and a value greater than 1 in tissues where the tracer accumulates. Dynamic cancer imaging is carried out with the radiopharmacon 18-fluoro-deoxyglucose (18F-FDG) which shows tumor glycolysis as a parameter of cell activity [58, 59]. The FDG uptake in the tumor correlates with the rate of glycolysis, being more intensive in neoplastic tissue than in normal tissue from which neoplasia arises. The correlation is strongest in aggressive tumor types; maximum values were registered in lung cancer. 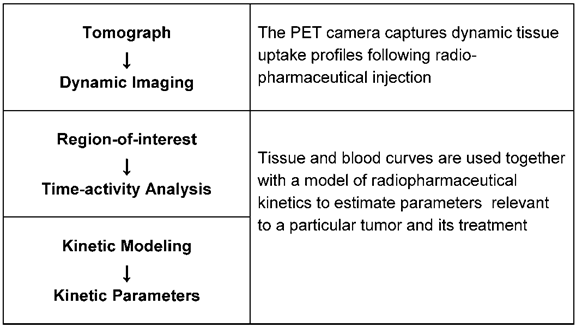 The combination of the PET camera with computed tomography (PET/CT) allows the exact anatomical localisation of very small tumor mass. The radiation exposure of patients is small, the half-life of 18-fluor only 110 minutes. Monitoring treatment response requires PET scans before and after the therapeutic intervention. The first scan is for staging the tumor activity, the second scan can show a therapy effect after 1 or 2 drug treatment cycles. A number of studies carried out on different tumor types could demonstrate the potential of 18F-FDG PET to diagnose drug response at an early stage of treatment. Table 2 shows tumor types for which results are already available [60-66]. Generally accepted criteria for response calculation, are still missing, which makes it difficult to compare the results of different studies. Quantification of PET values can be affected by some technical, biological and physical factors which must be considered in the calculations . Special attention has also to be drawn to different pharmacological actions of anticancer drugs. New targeted drugs, for instance, which suppress cancer- induced overexpressed cellular signal transductors and thus act mainly cytostatically compared with classical cytotoxic drugs require special timing of scans . International guidelines for PET tests are therefore necessary to guarantee the quality and quantitative accuracy of the results. Numerous studies are now in progress in order to make PET testing acceptable for routine clinical use. PET uses a similar principle to that of the in-vitro test of fresh cancer cell cultures by measuring cancer cell metabolic activities. However, the PET technique seems also to have the potential to guide therapies by imaging several metabolic steps in cancer cell growth; with the aspect to be used for diagnosing tumor drug resistance. The expanding development of new radiotracers offers the prospect that imaging may soon be possible for measuring cellular proliferation, tumor hypoxia, apoptosis and special growth factors like steroid receptors, human epidermal growth factor receptor, vascular endothelial growth factor and P-glycoprotein [69, 70]. Thus nuclear medicine methods, usable under in-vivo conditions, are likely to play a key role in future clinical cancer treatment. Tumor types for which FDG-PET assays are used to assess tumor response to cancer drug therapy. Drug resistance, a hitherto unsolved pharmacological problem in cancer drug therapy, accounts for much useless treatment and has caused much hardship to patients. Early diagnosis is therefore of crucial importance. Up till now oncological organisations still recommend, as guidelines for response assessment in solid tumors, anatomically based imaging. However, tumor size change is not a reliable sign of drug effect. Waiting for tumor shrinkage can postpone the diagnosis of drug resistance. Although methods of early detection were always desirable, not much effort has been made in past decades to support research in this field. Only recently has interest increased in improving drug response assessment, also in cancer clinical trials . Fresh cancer cell culture assays are still the only methods available to diagnose intrinsic drug resistance in the individual patient. However, there may be some difficulty to find a specialized laboratory that can carry out the laborious and error-prone assays and can guarantee reliable results. The laboratory can help to give detailed advice for the necessary clinical preparations. Patients' information usually causes problems, because the result, intrinsic drug resistance, signifies the detection of ineffective drugs, whereas the main interest understandably concentrates on finding effective drug treatments, which cannot be assured. It has to be made clear that the percentage of patients which do not profit from standard chemotherapies is usually high and that therefore the value of being able to escape useless treatments can be great. The high cost of tests has to be considered too, yet the costs of drug treatment are even higher. When cancer treatment has been started without testing intrinsic resistance, it is desirable to establish the drug resistance situation as soon as possible. This is now possible with the positron-emission tomography (PET) test described in detail above. Yet it can no longer be distinguished whether the failure of drug action is caused by an intrinsic or an acquired resistance. Acquired resistance may develop rapidly, as the results of a recent in-vitro study with human cancer cells of various types have indicated . On account of the extensive literature supporting the use of 18F-FDG PET, this method has already found widespread use in clinical practice; tests are carried out by nuclear medicine departments. Since the test is clearly superior to tumor size measurements it has already been proposed to replace the currently used “Response Evaluation Criteria in Solid Tumors” (RESIST) based only on anatomic imaging by “PET Response Criteria in Solid Tumors” (PERSIST) which has no limitation, particularly in assessing the new cancer therapy which stabilizes disease . Great hope of new cancer biomarkers, now detectable by analyzing biological samples with new techniques is curtailed by the fact that the host of markers, which can be found makes it difficult to detect suitable ones for clinical use. Markers for treatable subgroups of patients and for the surveillance of drug response during treatment are the main challenges of the ongoing research. Although some progress can be registered, reliable biomarker tests for drug resistance in the individual patient are still not available. The literature on optimizing cancer drug therapy by avoiding ineffective treatment is still sparse. Supportive therapy without knowing the situation with regard to individual drug resistance is obviously not worth striving for. In a recent book Bosanquet and Sikora discussing the future of cancer care note that the continuous flow of new and very expensive therapies also requires new treatment strategies . They state that selecting patients suitable for chemotherapy is now possible and would help clinicians to recognize which localized cancers can be left alone and which tumors will respond to drugs. Predictive assays would dramatically improve the quality of life. The authors also add that although the technology for revealing drug response exists, it has to be accepted that prediction will never be totally accurate and uncertainty will remain . Predictive assays for the diagnosis of cancer drug resistance are now able to optimize cancer drug therapy by individualizing it. In the present literature individualized (also called personalized) therapies are restricted to some subgroups of patients, selected by biomarkers which promise a better response. However, only the diagnosis of drug resistance in individual cases can exclude non-response. The long neglected research on individual resistance tests needs to be intensified by further developments. To make them easier and less costly to carry out would make them accessible to more patients. From a medical point of view a rethinking of the pharmacological strategy of cancer drug therapy seems to be necessary, i.e. the management may include, in cases of the detection of broad drug resistance, the omission of aggressive chemotherapy. This would help to avoid only making sick people sicker.